Israeli soldiers demolished, Monday, a Palestinian home in Mreyha area, near Ya’bad town, southwest of the northern West Bank city of Jenin. 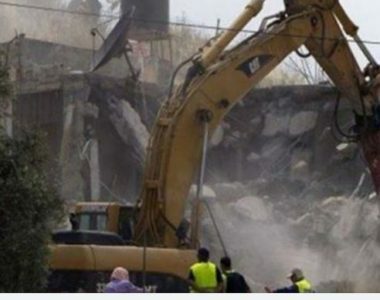 Ya’bad Mayor, Samer Abu Bakr, said dozens of soldiers invaded the area, and demolished a home, owned by Baha’ Amin Hamdouni. He added that the army claimed the home, a one-story building, was constructed without a permit from the Israeli Civil Administration Office. The demolished home is located in Area C of the occupied West Bank, under full Israeli control. Abu Bakr also stated that the area is subject to contact Israeli invasions and violations, as the military has demolished homes, and confiscated large areas of farmlands, in addition to mobile homes, in an attempt to illegally occupy the Palestinian lands. The area in question is located near illegal colonies and the Dothan military base. During the invasion and the demolition of the Palestinian home, the soldiers closed Dothan military roadblock, on the main road linking between Jenin and Tulkarem governorates, causing a huge traffic jam.